Ready to up your home management game? Want an all-access pass to the Mother Like a Boss™ goodies? 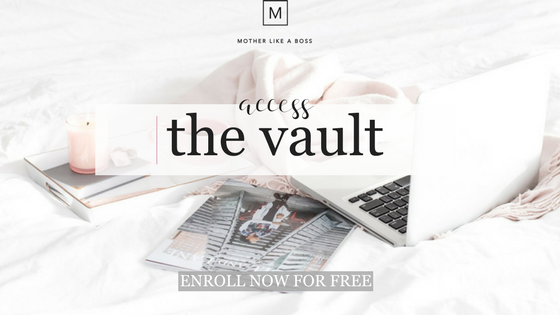 Join The Vault today for free and get exclusive checklists, worksheets, and value-filled content. Get free access to everything below. No need for links or remembering to save your emails. This is your exclusive place to access some of our most popular free goodies. Give me the guide and more! Ep. 130: Confessions of a "submarine parent"
Why should kids have all the fun? Come join the mamas of the Mother Like a Boss™ Playground Facebook group. Why a playground? Well, aside from the obvious link to motherhood and kids, I find playgrounds to be some of the most enjoyable places on earth. You can swing, climb, run, jump, dig, chase, balance and slide, just like all moms do everyday. You can make friends, bring the ones you have or do both. You can feel free and unjudged, because everyone around you is enjoying the same place at the same time. If you're looking for a fun, supportive and encouraging group of mothers helping one another and asking great questions, come to the playground. Plus, you'll receive tons of homemakerish help from yours truly. Oh, and unlike most other playgrounds, a little adult conversation isn't frowned upon.